It is normal for pilots to feel more "safe" when flying less than 500' above the ground. The ground looks welcoming and is a familiar site. On the other hand, being a mile or more off the ground is a perspective that we rarely experience. It can take a half an hour or much more to come down from high altitude. Also, what is going on way up there? Can I get blown away or sucked into outer space? Will I get hit by some careless aircraft? Will I run out of air to breathe? The only exception to this is air near large bodies of water and air in an inversion. Nonetheless, pilots who fly in inversions need to master their weather skills because the inversion can dissipate in minutes and you may be flying in air that is moving faster than your forward speed, i.e., you are now flying backwards. Even in inversions, the air near the ground can still be rowdy, though rarely. If you must fly PPG low, do it early in the day and always maintain enough altitude (typically >100' AGL) so that you can land in any direction. 2. Altitude Gives Time – Altitude always gives you more time to fix problems. For example, I was once flying a paramotor for a demo and my engine quit suddenly. I was thankful that I was 500' off the ground as I had time to make plans on where to land. In fact, I had enough time to attempt to figure out why the engine quit. The spark plug wire had come loose and I was able to reattach it and restart the engine. If I was 100' off the ground, I could never have done this. The same is true for PG. While flying Dry Canyon during an active time of the day, I had a major wing collapse (a complete frontal) and I was thankful I had a thousand feet to sort it out and recover. As it was, I lost 200' of altitude in a few seconds. At another time, at a benign site in early morning, a convergence of some sort caused the air 50' off the ground to suddenly nose dive to the ground while I was climbing out in a paramotor. I experienced not one but two frontal collapses in a row. The worst thing I could have done would have been to let off the power, as is the normal recommendation when experiencing turbulence. As it was, I went to full power and was able to quickly re-inflate the glider. I have never experienced this strange event before or since. This is just another reason to climb out quickly after launching. Altitude is ALWAYS good! 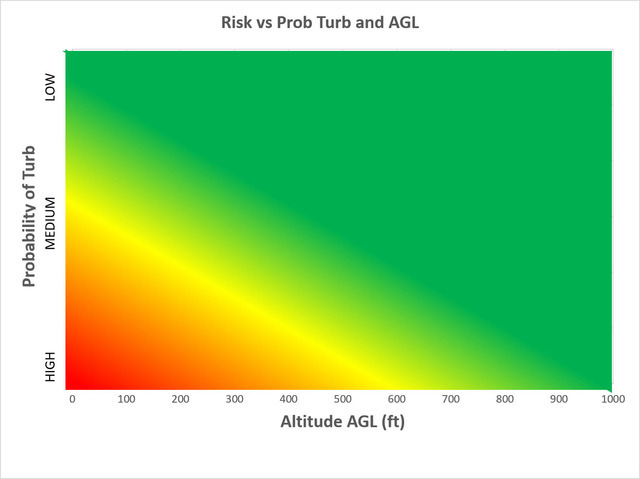 Note that if turbulence is high, you need to be at 1,000' AGL to deal with the risk! 3. Organized Air Higher Up – Thermals and ridge lift are always more organized the higher you go. Dust devils are deadly near the ground, especially if they travel over areas of green vegetation where they can become invisible. Once during a flight in the late afternoon, an invisible dust devil formed and I flew right into it with a paramotor. I was about 100' off the ground climbing out and was severely jolted by the force of the devil on one side of my glider. This is how we break lines, especially in PPG. To escape it, I dove away from it, taking great risk so close to the earth. In this case, I was very near water and, if I had gone in, I would have likely drowned. The dust devil should not have been there at that time of the day. Apparently, a mass of hot air was lurking in tall dry weeds and something allowed it to be released just as I flew over. (Maybe I was the one who disturbed the air?) Cascading events often get us pilots and this event could have resulted in an accident. Had I been much higher, the event would have been a non-issue. This is just another reason why pilots should always climb out as quickly as they can, whether PG or PPG. If you practice PPG "touch and goes", make sure you are close enough to the ground that sudden contact with it would not result in trouble. Altitude is ALWAYS good! 4. Check the Forecasts – The chances of a pilot getting sucked up 30,000' are nil if he does his homework before flying. The weather balloons sent up by the National Weather Service have nothing to do with being a forecast of some sort. The balloons capture raw data and accurately report what the winds and temperature are to the edges of the atmosphere. Pilots who do not check this kind of data before flying put themselves in serious danger. If the atmosphere is unstable or crazy aloft, fly another day. If winds aloft above the inversion are over 25 mph, make certain you land way before the inversion dissipates or, better, don't fly at all – maybe you miscalculated when the inversion would be gone? 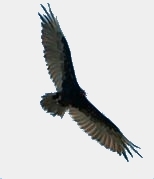 I have flown backwards and it can be unnerving going where you do not want to go. Don't fly without doing your homework beforehand. If you see towering cumulus clouds forming, land immediately – it's a simple technique for not having an adventure inside a rain cloud. 5. Altitude gives time – The higher you are the more time you have to plan where you might land in an emergency. Flying low over congested areas is not only illegal, it is dangerous. Pilots who assume they will not have to land for some reason need to get re-educated. Launching is optional, landing is mandatory and can happen at anytime. TRAIN YOURSELF ACCORDINGLY – NEVER FLY ANYWHERE WITHOUT HAVING THIS ALWAYS IN THE BACK OF YOUR MIND: WHERE CAN I LAND RIGHT NOW??? Failure to plan can lead to panic. It has killed or injured a significant number of pilots needlessly. Altitude is always good! 6. Panic – If you do panic while flying, altitude can give you time to get yourself together. Be ready for unexpected events. Do not think, "That can never happen to me!" Altitude is always good! 7. Air collision – I do not think a PG or PPG pilot has ever been hit by another aircraft. This is not to say that the reverse has not occurred, especially concerning hot air balloons. 8. Altitude is always good – Repeat this phrase to yourself often.